We woke to gorgeous sunshine, and a near deserted campsite. One of the advantages of camping in winter, is that most of the campsites have been almost empty. 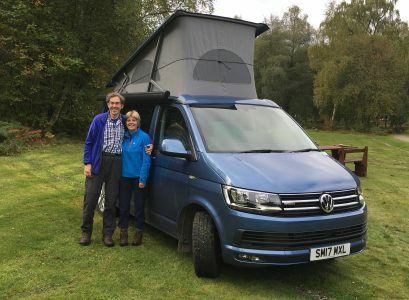 The majority of those other campers we do come across are in larger motorhomes, who have their own showers and toilets, and so by and large, Howard and I have had the washrooms and showers to ourselves thus far. This morning, I tried one of Howard’s tricks. I had my shower as usual, then quickly shuttled into the adjoining empty shower cubicle, which was completely dry, in order to get dressed without making everything wet from the floor. Clearly once there are more campers around, I will have to stop the ‘two shower’ habit. But for now, it works well. As we drove back past Aveiro this morning, from the main road we spied hundreds of birds on the flat marshes stretching out towards the estuary. So we back-tracked on ourselves, and went to do a bit of bird-spotting. The area is renowned for bitterns, but unfortunately there were none to be seen. We did, however, spot a number of egrets, herons, many unspecified waders (too far away to identify, even with binoculars), and later three storks sitting on their nests. We then headed inland towards the medieval city of Viseu. We stopped for coffee and a pastry (you can see there is a theme developing here! ), then set off on a mission. Since being in Europe, we having been using huge quantities of our data allowance, since on most of the campsites, the WiFi has either been non existent, or too weak to connect to our computers. On the advice of a friend, we did purchase a 3 MiFi before leaving the UK, but likewise, we have been eating up our data quota at an alarming rate, partially due to transferring text and photos to this blog, and also, I am sure, due to Howard’s weekly fix of streaming ‘Call the Midwife’ off iPlayer! We had a second MiFi provided by our phone provider sold to offer us internet in the continent. However, having not managed to get it to work at all since leaving Portsmouth, our UK provider emailed us back today rather red-faced to say that the reason that we couldn’t get it to work was simple – it does not work abroad! So we were in search of a computer / phone store to see if a local sim card might work in it. In the process of searching out some help, we meandered our way all through the old quarter of the delightful city of Viseu, with it’s cobbled streets, charming squares and tile-festooned houses and walls. We did find an extremely helpful lady in a phone shop, who tried every solution possible to get our MiFi to work with a local sim, but to no avail. The only solution would be to buy a new router in each country we visit, which would prove very costly. So, for now, we are stuck with using my phone as a hotspot, using campsite WiFi wherever possible (the one here tonight is again not working), or just being extremely frugal with the remaining data allowance I have from the only working 3 MiFi. I say all of this because it is quite likely in the near future, I may run out of WiFi, and may have to wait until we either check into a hotel again or find a Costas to post the blog. Yet again, though, we were truly impressed by the helpfulness of the locals – they really seemed to go the extra mile to try to resolve our problem. We have now arrived at our campsite for the next two nights – a complete contrast from the large pristine facility by the coast we spent last night. Oscar is parked up in the middle of an olive grove, with views over the countryside to the Sierra da Estrela mountains – just gorgeous! We are the only ones here, the staff are charming, and tomorrow we plan to do some walking in the National Park. My tea is now ready – garlic bread, tomatoes and vegetarian pasta, and my wine is poured. Good old Howard, alias 2 pot chef!